Shanghai rock bank Bremen plays in front of the Mercedes-Benz Arena in Pudong, as part of a one-year anniversary celebration for the opening of the World Expo Shanghai 2010. A couple jumped off the platform of a Metro Line 1 station in a suicide attempt today and brought the subway into a halt during the morning rush hour. The man was killed and the woman was injured by a fast moving train as it pulled into the station. The incident happened at 7:43am at Line 1's Gonghe Xincun station where the couple was seen jumping into the tunnel just as the train was coming into the station. They were carried out by Metro staff before 8am and the operation gradually resumed. Passengers were stranded at some busy stations along the line. The man was pronounced dead at the hospital while the woman was in a critical condition. Police are investigating the case. Things can move slow at airports in China..
Last week when we were flying to Xian, I was pleased when we arrived at Pudong airport and saw that China Eastern had self check-in stations (as usual in China, the lines to the check-in counters were pretty long). Although the stations were only in Chinese it was pretty straightforward and we quickly managed to put our information, pick our seats and print our boarding cards (but not bag tags, those you werent able to print). Mom and dad had a bag they needed to check in, so we located a counter that said bag drop and lined up. There was a huge line to this counter, and first I thought it was some kind of misunderstanding. Were all of these people really lining up just to drop off their bags? They sure were. All of us in the looooong line were holding on to our boarding cards, impatiently glancing at our watches and staring at the actual bag drop counter where action seemed to be very sloooooow. METRO builders said yesterday that construction on all 77 stations along four new subway lines has started. The new lines, 11, 12, 13 and 16, will see passenger volume increase about 10 percent. More than 5 million passengers use the Metro network each day. -Travel here with a suitcase full of Easter eggs and Swedish chocolate for their beloved daughter. -Enjoy sitting down for a coffee and sandwich (mom) or a cake and beer (dad) every day of their holiday week (What are you supposed to do? Not join them?!). -Encourage you to share a bottle of wine with them for dinner. Pretty much every day. -Hides chocolate in your apartment (yes, for real) before departure so that wont miss them too much. A man soaks up the sun on an artificial beach on the Bund yesterday, which was the hottest April 26 on record in the city. Temperatures reached 33.2 degrees Celsius, said the Shanghai Meteorological Bureau. It said days with the mercury creeping past 30 degrees are not rare in April as the city usually experiences some ups and downs in spring temperatures. "High temperatures occur in April," said Man Liping, chief service officer of the bureau. "For example, in 2004, the mercury hit 33.5 degrees Celsius on April 22." Today is forecast to be showery with the high expected drop to 23 degrees, the bureau said. The low should remain at 16 degrees. Tomorrow should turn cloudy and more rain is expected at the weekend. A household in Luwan District caught fire this afternoon after a man attacked his father and brother and lighted their home in a dispute. Luwan District police said the suspect surnamed Xia had been taken for investigation. Xia's father and brother were hit in the heads and ran out of their house at 217 Ji'nan Road before it was set ablaze, neighbors said. The two were in stable conditions. Police said the fire was reported at 12:54pm and was put out at 1:15pm by the fire department. Officials said the cause of the fire was still under investigation, but they confirmed it was triggered by the family conflict. Xia, 48, was allegedly suffering mental problems and always had an illusion of the end of the world, according to his neighbors. SHANGHAI police have caught the man who allegedly killed a female real estate agent in Putuo District last week. The man, surnamed Zhao, stabbed the victim after a fierce quarrel with her over the rent price in an apartment in Putuo's Ganquan community on April 21, police said today. Zhao was nabbed on April 23 and a dagger was found in his place, said the police who are still investigating the case. Day 2 in Xian was all about the Terracotta Army . Since we were flying back to Shanghai that night we decided to get a driver for the whole day, so that we could keep our luggage in his car, and, so that he could take us to the airport after we had visited the sight (the terracotta army is located quite far away from Xian so going back and fourth to the hotel did not feel like an option). I chatted to the bell boys at our hotel for about 30 minutes until we came up with a good deal and were assigned Mr Guo, a black car driver, to take us around for the whole day and then drop us off at the airport. MAJORITY vocational school graduates in the city earns more than 2,000 yuan (US$306,97) per month, according to a survey by the Shanghai Education Commission. The commission conducted a salary survey on 14,758 vocational school graduates who were employed in 2009 and found 45 percent of them are now earning 2,000 yuan to 2,500 yuan a month. About 19.52 percent of them have a monthly salary of more than 2,500 yuan and 8.7 percent have making more than 3,000 yuan a month. About 97.44 percent of local vocational school students who graduated last year have landed a job, 1.48 percent more than the previous year, the commission officials said today. The commission plans to enlarge vocational schools to cover all students who failed to enter high school in the next five years. Thursday (dads birthday) started off with a hike to the city wall (which was conveniently located next to our hotel, however, where to get up on the wall wasnt as obvious as we first thought. We had to look for a while until we managed to locate the south gate). Once we got there we rented bikes and rode around the wall. It was a bumpy, noisy ride, but due to the fact that the peak season hadnt yet started it wasnt too crowded and we enjoyed ourselves... until mom realized that she had dropped her jacket and we had to go all the way back on the wall (and no, we still didnt find the jacket). Shoulders are rubbed and cameras are raised as the crowd try to get a view of the fancy cars exhibited at the 14th Shanghai International Automobile Industry Exhibition at the New International Exhibition Center in Pudong. Up to 130,000 visitors braved the crowds to attend the event yesterday, the first day the show opens for the public. Montessori School of Shanghai students show off bags of seeds during an activity to celebrate World Earth Day yesterday. They were told to plant the seeds to enhance their awareness of environmental protection. SHANGHAI officials have pledged to end the use of swill oil and the abuse of food additives during a six-month crackdown to ensure the city's food safety. A conference chaired by Vice Mayor Shen Xiaoming on Tuesday decided to launch the campaign amid public concern over a series of food safety scandals in the city and across the country. Officials urged the elimination of management loopholes, which were exposed during the city's tainted buns scandal, as watchdogs had no idea about the problem despite the buns being on sale for several years. Woho, finally time to do some travelling within China again. It's been a while! I'm taking my folks to Xi'an to check out the city wall, the great mosque and, of course, the Terracotta army. We'll also make sure to celebrate dad's birthday tomorrow -probably a quite original birthday for him! I'll make sure to share some photos and stories when I get back -until then: Happy Easter! Forgive my absence, but Im hosting a delegation, much more important than all those royalties and ministers I met last year, and its taking up pretty much all of my free time: yes, of course, my parents are in town! -Hey, we are standing in a crossing and we dont know where we are. -Eh right. Now, do you see any names of streets or anything around you? -Naaah, its kind of confusing to tell you the truth. -So does the hotel breakfast have any yoghurt? -I dont know mom, Ive never eaten it. -Yeah, but what about normally over here? A worker puts up a sign at the revamped Shanghai Cultural Plaza on Fuxing Road M. in Luwan District yesterday. The underground musical theater, formerly known as the Canidrome, which was built in 1928, will reopen in August after a six-year, 1.1 billion yuan (US$168 million) renovation project. SHANGHAI industrial and commercial authorities seized more than 6,000 "dyed" steamed buns at the Shanghai Shenglu Food Co. today after the tainted bun scandal was reported yesterday. The buns already passed their shelf life and were thrown into mixers to make "new" buns. The officials have asked local stores and supermarkets to remove the company's products from their shelves. The sales of steamed buns dropped across the city yesterday after the scam was reported in local media, Shanghai Daily found. Customers said they were worried that buns made by other companies may also have the same problem, so they chose not to buy steamed buns for a while. Lianhua Supermarket said today that customers can use their receipts for a refund for the buns they bought at the Lianhua supermarkets. SHANGHAI is seeking public opinions for a local regulation on house renting, according to a guideline proposed today by the city's housing administrator on its website. Under the guideline, home owners cannot raise rents if the tenant signed a contract for one year or less. Rents can only be raised on an annual basis if the contract is longer than one year. Meanwhile, a security deposit of one month's rent is allowed for a contract lasting one year or less, while a deposit of two months' rent is allowed for a contract longer than one year. Home owners should also inform their tenants one month in advance if they want to terminate the contract before it expires. Jogging enthusiasts set off as this year's Jinqiao 8k, an annual long-distance race held in Jinqiao Biyun International Community in Shanghai's Pudong New Area, gets under way. The event, with both an 8 kilometer race and a 2 kilometer fun run, attracted several thousand residents from the community, half of them expats. I had the most amazing day yesterday! One week of hard work finally saw its results when Swedish Noir&Blanc showed at Shanghai Fashion Week, followed by a high heel after party at Gte Gta store. The Noir&Blanc fashion show was fantastic. The designers teamed up with dance club Jazz du Funk and did a pretty exquisite cross over show that opened and closed with a dance sequence called Black Sun (see the video at the end of this post for the short closing performance, mind the shaky video, as I was applauding while filming multi tasking, you know!). The dance worked super well with the actual collection: Ethnic Euphoria, which is about tradition and ethnic symbols, pattern-mania, knitted influences and draped fabrics. SHANGHAI Muncipal Government will hold a meeting next Tuesday to discuss the development of public cultural facilities and services. During the meeting, participants will review work done in the past five years and set targests for development in the 12th Five-Year Plan period starting from this year. On agenda for discussion are plans for the construction of Shanghai History Museum, Shanghai Modern Art Museum and the second phase of Shanghai Library. There are also proposals for more and better digitalized cultural services such as digital library, digital museum, digital art gallery, and self-help book borrowing system to meet the needs of people in the digital age. Foreigners working in Shanghai are reminded of renewing their information at their local police stations if they have changed jobs, said the Shanghai Exit-Entrance Administration Bureau today. A foreigner, whose name is not revealed, was found using outdated materials to apply for an extension of his residence permit because he failed to update his job information within 10 days after he changed job last October. Since he violated the relevant regulations, he had to apply for a new residence and employment permit. The bureau said foreign workers have to get permits from the local labor and public security authorities in order to live in Shanghai. Once they changed their jobs, they had to renew personal information within 10 days to avoid complicated procedures later. A friend of ours is visiting from Europe, partly for work and partly to see his Chinese girlfriend. Neither him, nor we thought that it was going to work out between them when he left China some 1 year ago but, believe it or not, the 2 of them are more in love than ever! Its absolutely lovely to see and shes planning to move to Europe eventually to be with him. 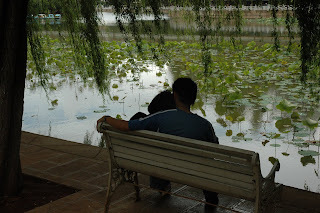 I have to say that it is especially nice to see the two of them together and in love, especially considering how many questionable Suzhou ladies this guy dated before he met his current girlfriend. Last night (after a gym work-out, I re-started my new, healthy life for the 2984698264th time yesterday I know, I know, such a clich!) I caught up with my old language partner from Suzhou who was in Shanghai for Qing Ming Jie. If you have followed this blog for a while you probably remember her: shes the one who learned English with Desperate Housewives, only ate apples in order to lose weight, and had a boyfriend who made her a home gym when she said she wanted to start exercising. Gosh, Ive missed her! Since I left Suzhou she has gotten married and she and her hubby has bought a car. -Great, is it a new car? I asked. -Of course. 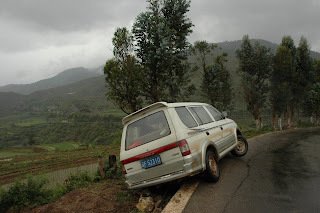 In China, no one would buy an old car. -Right (I always forget!). So do you drive every day to work now? -No my husband drives. I have a license but I cannot drive. -Yeah, I bought my license some years ago but I dont know how to drive. -Yes! What you cannot buy a license in Sweden? Crowds in Gucun Park take advantage of the fine weather yesterday in Shanghai and the ongoing Qingming Festival to view cherry blossom. More than 100,000 visitors crowded into the park in Baoshan District to enjoy a Cherry Blossom Festival, which began last Wednesday in the city's biggest suburban park. This was the largest number of visitors in a day the park has handled since it opened. Its popularity forced Gucun Park Station on Metro Line 7 to close for 90 minutes from 4pm to restrict the number of passengers in the station. The 21-day festival features more than 10,000 cherry trees of 20 different varieties. On Saturday, since our office does not follow the Qing Ming Jie holiday schedule, I was enjoying a day off and popped into All Days (convenience store) to get some ice creams for the pancakes that I was planning to make later (yeah, really made the most of my Saturday as you can hear. FYI: now on a no-pancake diet for the next 2 months it went a bit overboard). 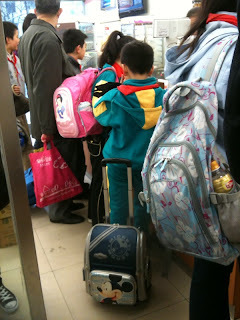 As I was lining up to pay, I noticed the cute, Chinese kids that were milling about some with huge backpacks and some dragging around mini suitcases with Mickey Mouse prints. Were they going on some kind of school trip? Oh no they were not, I realized, when I 5 minutes later stepped out of the store and saw one of them being picked up by his grandpa on a scooter. They were just heading home after a normal day at school. Carrying such a load of heavy books, that they drag them around in mini suitcases rather than carrying them in backpacks. Just like me when I was a kid. Not. LOCALS are invited to help select the city's top 10 villages in terms of environmental and public amenities. The Shanghai Agricultural Commission has organized the competition, hoping that the results will provide guidance on where to travel in the suburbs. Some 25 candidate villages are scheduled to take part, and the public are asked to make their choice online or through newspapers. Experts will also be involved in the judging, with criteria including transport facilities and restaurants. The final results will be announced in the autumn, the ideal traveling season. Officials believe the competition will help attract more visitors to the villages and promote their agricultural produce. THE construction of Shanghai Disneyland is expected to begin on Friday, said an anonymous government official yesterday who is involved in the project. The agreement on the project was signed last November. The new theme park will be the first Disneyland on the Chinese mainland and the fourth outside the United States, after Paris, Tokyo and Hong Kong. The cost for the first phase of the project is expected to amount to 24.5 billion yuan (US$3.74 billion), Shanghai Mayor Han Zheng said on the sidelines of the annual parliamentary session in Beijing in early March. Earlier reports said that 116 hectares of land has been allocated for the Disneyland project in the Pudong New Area. Two Metro lines will converge at the area. Qingtuan, or glutinous green dumplings, are sold at the city's famous Wangjiasha dim sum store yesterday. Local industrial and commercial authorities said yesterday about 10 percent of qingtuan tested in the city failed a quality inspection, including some time-honored brands, such as Wangjiasha and Xinya. The snack is popular around the Qingming Festival, which falls next Tuesday. The Shanghai Industrial and Commercial Administrative Bureau inspected 50 samples collected from local supermarkets and food stores. The products which failed, such as a box of Wangjiasha sweet-beanpaste-stuffed Qingtuan sold at the Shanghai No.1 Food Store, were found to contain colibacillus, which may cause vomiting and diarrhoea, said the bureau. Other brands, such as Xinya and Luyangcun, had the same problem. The products were removed from shelves, officials said.